The UNESCO Youth Forum, held prior to UNESCO's General Conference, brings together young delegates from all over the world to exchange views, share experiences, reflect together and, above all, detect common preoccupations and problems. The event allows young people to voice their ideas and concerns and make suggestions directly to the UNESCO General Conference. The Forum is part of the UNESCO General Conference, highest decision-making body in the Organization. 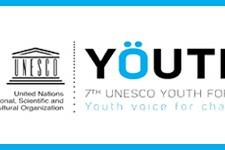 It was initiated in 1999 as a way to bridge the gap between UNESCO’s work and youth organizations. The Forum is a 2-year process that enables youth to submit their recommendations to representatives of 195 Member-States, while at the same time mobilizing these youth in undertaking concrete follow-up action to support the implementation of their ideas. The 9th UNESCO Youth Forum took place at UNESCO HQ in Paris in October 2015. The next Youth Forum should take place in 2017.